Tangle drawing is a powerful tool for people looking to tap into their inner artist. 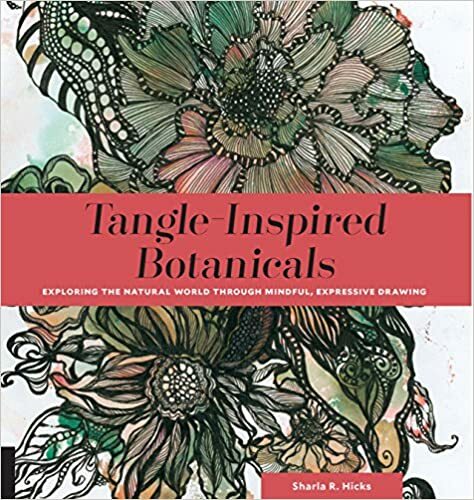 This book guides readers in exploring and developing their own style of Zentangle-inspired botanicals, land and seascapes, lush foliage, and mixed-media color enhancers. The author uses nature photographs and monoprints embossed with flowers, leaves, and grasses for Zentangle inspiration. Sharla Hicks has been a Certified Zentangle Teacher since 2011. She has a 40-year background as a mixed-media and textile artist, fluent in painting, collage, printmaking, quilting, and fiber techniques. Today, her primary focus is offering lectures, retreats, and workshops around the world to produce innovative Zentangle-inspired art pieces. Cassandra's Review -- The art in this book is beautiful and easy to get lost in. Great for teaching and inspiring any age. The steps are detailed and this book opens a new way to be creative.